Recent studies have challenged the prevailing dogma that transcription is repressed during mitosis. Transcription was also proposed to sustain a robust spindle assembly checkpoint (SAC) response. Here, we used live-cell imaging of human cells, RNA-seq and qPCR to investigate the requirement for de novo transcription during mitosis. Under conditions of persistently unattached kinetochores, transcription inhibition with actinomycin D, or treatment with other DNA- intercalating drugs, delocalized the chromosomal passenger complex (CPC) protein Aurora B from centromeres, compromising SAC signaling and cell fate. However, we were unable to detect significant changes in mitotic transcript levels. Moreover, inhibition of transcription independently of DNA intercalation had no effect on Aurora B centromeric localization, SAC response, mitotic progression, exit or death. Mechanistically, we show that DNA intercalating agents reduce the interaction of the CPC with nucleosomes. 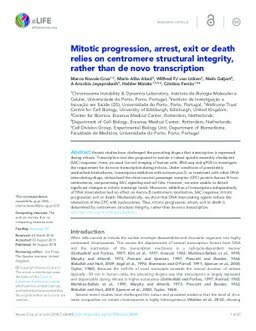 Thus, mitotic progression, arrest, exit or death is determined by centromere structural integrity, rather than de novo transcription.